These child protection and safeguarding procedures are for nine Local Safeguarding Children Boards in the West Midlands and are effective from 31st March 2017. A project proposal was successfully submitted to DfE on behalf of the West Midlands Safeguarding Children Boards to develop regional safeguarding procedures. 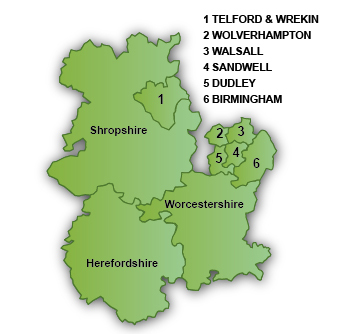 It was felt that it would be sensible to move to a more regional approach to multi-agency working around safeguarding, especially in light of the fact that so many partner organisations (including Police, Probation, Health and many others) span an area that crosses local authority boundaries. With respect to the Local Area Specific Safeguarding Information and Procedures please choose from the drop-down list to access the localised content for your respective area. If you are a professional and want to make a referral to Children’s Social Care, use this link and choose the area you’re working in. This page is correct as printed on Thursday 25th of April 2019 09:01:14 PM please refer back to this website (http://westmidlands.procedures.org.uk) for updates.